"My staff and I stand for a steadfast attention to detail and a commitment to excellence in everything we do, and this commitment is reflected in the high level of satisfaction of our patients." - Kevin B. Mayfield, M.D., F.A.C.S. A commitment to unparalleled personal service. "I think that the ability to personally offer both cosmetic plastic surgery and nonsurgical skin rejuvenation techniques in a small boutique-style setting, combined with my dedication to providing individualized service to each patient, sets my practice apart as a unique choice in today's competitive cosmetic surgery and medical spa markets. Nothing is spared when it comes to patient safety, comfort, and satisfaction." - Kevin B. Mayfield, M.D., F.A.C.S. A patient is never just a patient. "I have always believed that my success depends not on the quantity of services I provide or surgical procedures I perform, but on the quality of my work and ultimately the satisfaction of my patients. I seek to build long-term relationships based on mutual trust and loyalty, with the objective to become an essential resource for my patients' aesthetic goals throughout their lives. Crucial to my success has been taking the time to understand each patient's individual objectives, anticipate their needs, propose appropriate and effective solutions, and then deliver them in a safe and caring environment." 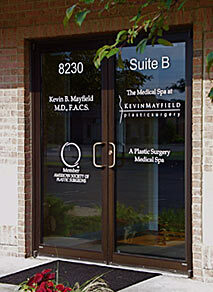 - Kevin B. Mayfield, M.D., F.A.C.S.